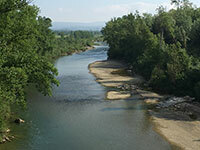 The river Ombrone makes its way through the southern part of the Chianti hills and the area of Crete in the province of Siena and then extends in to the province of Grosseto via the Ombrone hills. 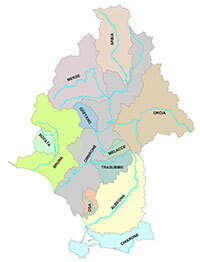 The entire geographical area borders the province of Siena and Val d’Orcia to the north. To the east it’s closed in by the volcanic cone of Mount Amiata, the hills of Albegna and Fiora are to the south east, south west is the Maremma of Grosseto while north west the territory continues up to the edge of the Metallifiere hills. 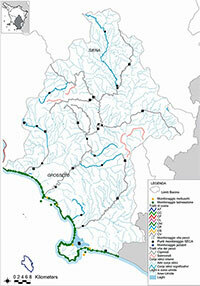 The Arbia is a small stream which rises a few miles south of Siena and rows into the Ombrone river at Buonconvento. On its left bank is the hill of Montaperti, where the Ghibellines overwhelmingly defeated the FIorentine Guelphs in 1260. 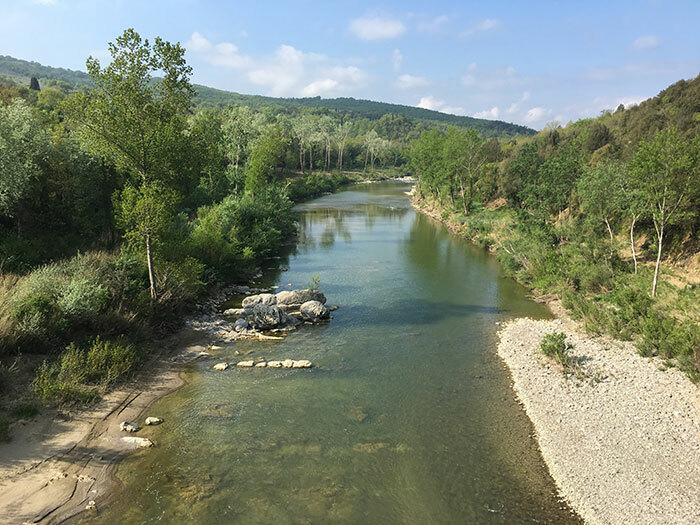 The Ombrone river marks the border with Montalcino (SI) and then continues through the districts of Civitella, Paganico, Cinigiano, Campagnatico, and Grosseto, before running into the Tyrrhenian sea at Bocca d’Ombrone. 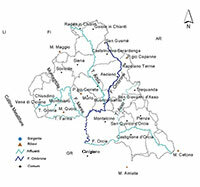 The area encompasses three districts in the province Montenero d’Orca, Istia d’Ombrone, with Grancia, Batignano, and Montepescali in the province of Grosseto. The landscape alternates between river vegetation, woods and vast areas of cypress trees and cork oaks which shade the roads and separate the various farmhouses. East of Cinigiano , the first signs of chestnut trees appear below Mount Amiata. In its last phases before the mouth of the river, the Ombrone passes over the huge plain of Grosseto in the heart of the Maremma. This valley has similar temperatures to those of the Maremma at Grosseto but with added daily thermal influxes, a minor maritime effect, and some climatic features similar to those of the continent. A hike to the source of the Ombrone river, near Castelnuovo Berardenga. Where the river Ombrone meets the Tirrenian Sea. It is reachable by walking 2 km from Marina di Alberese, along the beach. The walk is a photographer's dream, as the coastline is filled with large debris and sun-bleached logs. Photo created by Gabriele Delhey on April 4, 2006, "Alberese-Strand". Con licenza CC BY-SA 3.0 tramite Wikimedia Commons. One of Tuscany's best kept secrets is the beautiful valley sheltering this recently renovated 18th century farm house, Podere Santa Pia. This formal small cloister is the perfect spot to slow travel. Waking up at dawn to start hiking, learning once again the names of flowers and trees, and above all, having the pleasure of getting lost, forgetting about guides, clocks and timetables.